Large food manufacturing facilities, high-tech environments, and applications requiring maximum productivity have made the Tennant 7300 the industry standard. Customers do not have to sacrifice power, productivity, or durability when choosing this battery powered scrubber sweeper. Note: There is an updated version of the Tennant 7300, now called the Tennant T17. 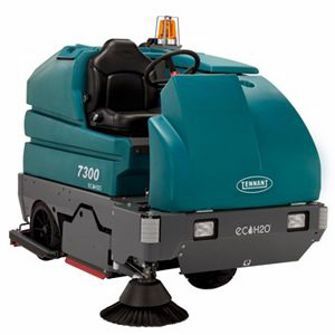 Learn more about the Tennant T17 scrubber. The first qualification of any “industrial quality” scrubber is durability. The Tennant 7300 is completely wrapped by a heavy steel channel bumper with built-in non marking rollers. The squeegee system, available side brush, and edge cleaning system are all designed to move out of the way when they encounter obstacles like racking or walls. Automatic squeegee lift in reverse and the available squeegee protection package prevent most damage that can occur while backing up. The Used 7300 is available with either a “disk” or “cylindrical” scrubbing system. Disk systems are popular with companies that want to polish or maintain polished concrete. Tennant offers quick-change tools for both of these processes. Tennant pioneered the use of “cylindrical” scrub heads to scrub and sweep in our industry. The 7300 has the most powerful and reliable scrub head system of any battery machine in our industry. Productivity ratings are truly extraordinary. With the optional 48” scrub path the 7300 can realistically scrub and sweep about 60,000 square feet per hour. Water saving options like EcH2O and FaST along with a large 57 gallon solution tank allows operators to keep scrubbing longer without stopping to refill. The 7300 has the longest run times available in its class. This machine is capable of carrying industrial batteries of up to 750 AH capacity.